After I walked out of the café, I realized that the Barista had just described “Haldi Dhood” also known as “Golden Milk,” which has now become the new craze in cafes around the globe. For centuries, this so-called “Golden Drink” has been part of Ayurvedic medicine and is a staple medicinal drink in many Indian households. Back in the day when people didn’t have access to or couldn’t afford conventional over the counter medicine, this Golden Milk was the godsend solution to combat many serious health issues. 2. Pour into a small saucepan and heat for 3-5 minutes over medium heat until hot, but not boiling. With summer in full swing, now’s a great time to start a new healthy habit! One great way to get more fruits and vegetables into your day, and one of my personal favorites, is by making smoothies. Smoothies are a quick and easy way to make sure you’re getting tons of important nutrients and fiber into your daily diet! The 3 key components to any great smoothie are fruit, greens, and liquid. Amounts and ratios of these 3 ingredients will vary depending on your preference. But as long as your smoothie includes all 3, you’re sure to have a nutrient rich meal right in your hand! Let’s start at the beginning. Fruits, and especially berries, are packed with tons of vitamins, minerals, antioxidants, and fiber! Adults need 2 cups of fruit per day. Putting fruit into a smoothie helps you get the recommended amount in a fun and easy way. I like to use fresh and frozen fruit in my smoothies. Adding a fresh fruit, like half a banana, makes the smoothie extra creamy. Frozen fruit is also great because it saves money and time! Frozen fruit is picked and frozen at peak freshness so you get the optimal amount of nutrients Here’s a tip: stock up on your favorite frozen fruit when it’s on sale. Not only will it save you some money, but you won’t have to worry about your produce going bad! Using frozen fruit also means you don’t have to use ice cubes which saves you a step in the smoothie making process. About half a cup of fresh fruit and 1 cup of frozen fruit should do the trick to make your smoothie flavorful and creamy. Next is the greens. Putting kale or spinach in a smoothie may seem a little scary, but trust me! Adults need 2 ½ cups of vegetables per day, and that includes leafy greens. Once they’re blended up, all of the other fruits and add-ins will mask the flavor of the greens. So, if spinach or kale isn’t your thing, just give it a shot; you can barely taste it! Adding 1 cup of leafy greens to your smoothie will increase its nutrient content and cover a large part of your recommended vegetable intake for the day. Now we need to get that creamy smoothie consistency. Adding a little amount of liquid will make your smoothie extra thick; adding more liquid will make it smoother and easier to drink through a straw. Depending on the kind and amount of liquid you use, you could be adding some healthy protein to your day too! Adding yogurt or milk will make the smoothie extra rich and incorporate some protein into your day. Try using half yogurt and half liquid if you want! Start with a little and add more liquid as you continue to blend. You can always add more liquid, but you can’t take it back. Don’t be afraid to try different things to find what works best for you! Lastly, there are some extra add-ins that you can put in your smoothie to make it your own! Things like honey, peanut butter, protein powder, cinnamon, ginger, chia seeds, and many others could really take your smoothie to the next level by adding more nutrients and flavor! Smoothies make a great on-the go- breakfast or snack. Here’s another tip: prep your smoothie the night before in the blender and put it in the refrigerator. Then, in the morning, all you have to do is take it out and push a button! Smoothies are all about trying new combinations and experimenting with different ingredients and ratios. If your first smoothies doesn’t come out so great, try again the next day! Soon you will learn what works for you, what combinations you like the best, and what consistency you prefer. Happy blending! How does India use social media? In India, around 462 million people are online. That’s only 34.8% of the total 1.3 billion population, but India has the second most social media users in the world. Since 2015, the country has experienced a 30.5% increase in social media users. Mobile data, or access to the internet on a smartphone, has become affordable and ubiquitous in India. In 2017, 1.06 billion persons, 79% of the population, had a mobile subscription. Just by looking at those numbers, we can say that accessibility of the internet in India will become widespread in the next few years. As per the 2017 statistics, there are more than 260 million social media users in India. Among those active users, Facebook is the most prominent social network with around 241 million users. The next largest social platform is LinkedIn which has 42 million users. The third largest network, with 23.2 million active users, is Twitter. Moreover, Google.co.in is the most visited site in India, followed by Youtube.com. Social media users in India spend most of their time on Facebook. India has the most extensive base of Facebook users with 241 million users followed by the United States with 240 million users. Rajesh Prabankhar, an analyst, reports that users of social media in India are mostly young urban males below the age of 34. LinkedIn is the second most popular social network in India with 42 million users. It is just behind the United States which ranks number one regarding users. The business head of LinkedIn in India, Hari Krishnan, said in an interview that the use of mobile devices has changed a lot in LinkedIn users’ behavior. They mostly focus on four key things - user profiles, inbox, groups, and status updates. Many young people in India are running YouTube channels. They have become full-time YouTubers and are turning it into a profession. If we talk in broader terms, video consumption is also on the rise. YouTube is the second most visited website in India as per Alexa. Isn’t Twitter famous in India? Only 17% of the total social media users in India use Twitter. However, we have witnessed an increase in the number of Twitter users in recent years. Presently, Twitter has around 23.2 million active users per month. Who is famous on Twitter in India? According to a report, the behavior of social media users in India is not dissimilar from rest of the world. 53% of users look for sales and discounts, 50% of users wish to know about industry trends, and 48% wish to seek advice on using or maintaining products and services. The most prominent brand on Facebook, according to Socialbakers, is State Bank of India. State Bank of India has the most number of fans with 15,221,645 likes on their Facebook page. The second most popular brand on Facebook is Samsung Mobile India with 156,507,479 likes on their page. Tata DoCoMo comes in third with 12,827,231 likes on their Facebook page. The most popular brand on Twitter is the Indian commercial bank Yes Bank with 3.33 million followers. Number two is Ridlr Mumbai, a mobile ticketing app, with 3.1 million followers. The State Bank of India is also a famous on Twitter with the third largest follower base of 3.24 million followers. The 2017 campaign “Indian Food League” was run by the snack brand Hippo. It was simple, but the idea was innovative for Indian fans. The focus was on India’s love for cricket and putting regional dishes against each other. The campaign was run in 2017’s cricketing season and depended on the understanding that families and friends eat together while watching cricket. Using Facebook and Twitter as the hub of their campaign, the company encouraged users to comment on a virtual chalk sheet that shows the day’s menu. India is known for holding colorful festivals that pay homage to the changing seasons, Lohri is no different. Lohri is held on January 13th of every year and provides another beautiful opportunity to rejoice with and cherish your family and friends. It’s primarily a Punjabi festival celebrated in Northern India but, people from all around the world take part and relish in Lohri activities. Lohri celebrates the passing of the winter solstice. This signifies that the shortest days of the year have passed and, with more daylight hours to come, it also symbolizes the alleviation from the dreary winter. Lohri is an ancient festival with roots in the history of the Indus Valley Civilization. It’s incorrectly believed that Lohri marks the end of peak winter chills, and welcomes spring. However, it actually signifies the harvest of the Rabi crops. ‘Fire’ is a prominent element during Lohri. It stands for fertility, energy, regeneration, and spiritual strength. Fire is so popular that some incorrectly believe that Lohri celebrations present an occasion to worship the fire deity, Agni. Bonfires are held across the land. They represent Agni and people pray to the Sun god for favor and protection. Worshippers use this time to show gratitude towards the Sun god for providing warmth to the Earth. They throw foods into the bonfire like peanuts and til (sesame), gur (solidified sugarcane juice), and rewaries (an Indian sweet made of til) while dancing merrily around the bonfire and singing folk songs in unison. It has become trendy for newlyweds to throw sesame seeds into the fire in hopes that they will have a child. For this reason, families with new brides and grooms normally show even more zeal during the Lohri celebrations. Lohri doesn’t just depict a seasonal change or the harvesting of crops. It also is a commemoration of the legendary character ‘Dulla Bhatti.’ Folklore tells us that Dulla Bhatti (shortened from ‘Abdullah Bhatti') took from the rich to give to the poor. He also saved young girls from forced slavery among other acts of heroism. The presence of Dulla Bhatti dates back to the reign of Mughal Emperor ‘Akbar.’ Akbar allegedly executed Dulla Bhatti for his revolt. Dulla Bhatti adopted two young girls ‘Sundri’ and ‘Mundri’ whom people remember through Punjabi folk songs such as ‘Sunder Mundriye’. How Do People Celebrate Lohri? Lohri celebrations are similar to traditional Punjabi-Indian customs. People wear colorful clothes, sing folk songs, and dance to express their joy. Children wake up early and go door to door singing the folk songs. People reciprocate by rewarding the children with money. In the evening during sun down, people gather around the bonfire. They throw in sesame seeds, peanuts, and puffed rice into the fire to express their devotion and gratitude. Various delicious traditional dishes made from seasonal food items mark the day. The famous makki di roti with sarson da saag is the preferred dish for dinner. The til rice, gur, rewari, and gajjak are usually served as desserts. The celebrations do not end with Lohri. Rather, the festivities extend to the following day as Maghi, as known in Punjab, or Makar Sankranti, as named in the other parts of the Indian subcontinent. Lohri is one of the few Indian festivals that follow the solar calendar while the other follow the lunar cycle. Lohri provides a much-needed occasion during the peak of winter to celebrate with the family and reunite with those we love. When most people think about “eating Indian food” in America - what they’re actually thinking about is a nationalized uniform version of Indian food. Most don’t realize that the regional diversity of Indian cuisine is as distinguished as its culture. Each region of India has its unique varieties. A book could be written about the culinary intricacies of each region. India has 29 states and seven union territories, but for the purpose of this blog post, we are dividing India into four regions: South India, North India, East India, and West India. South India has five states: Kerala, Tamilnadu, Andhra Pradesh, Karnataka, and Telangana. Culture and geographic region play an important rule in South Indian food. The climate is hot and humid with most of the states being near the coast. South Indians are primarily vegetarian, yet pescetarianism is very common as the inhabitants are fond of seafood. All things considered, South Indian food is the spiciest among all other regions. Most of the food is hinged around rice. Rice is pooled with sambar which is a soup-like lentil dish tempered with chilies and spices. Sambar is another soup-like lentil dish and is usually centered with rasam. It’s common for hosts in South India to offer their guests papadum (crispy lentil pancakes), coconut based chutneys, and filtered coffee. A meal is not complete without some form of rice complement. Lentils are a close second to rice. South-Indian favorites like idlis, which are basically steamed cakes prepared from rice batter and dosas, which are crepe-like pancakes, both contain Lentils. Essential ingredients and spices: fenugreek seeds, chilies, tamarind, pepper and peppercorns, asafetida, mustard, and curry leaves. The climate of North India flirts with both extremes of the spectrum. They have frigid winters and scorching summers. The states in North India include Madhya Pradesh, Chattisgarh, Jharkhand, Bihar, Haryana, Uttar Pradesh, Uttaranchal, Punjab, Himachal Pradesh, and Jammu & Kashmir. Its connection with the sub-continent (commonly referred to as South Asia) influences both its food and culture. Two types of cuisines dominate North India - Kashmiri and Mughlai. The curries of North India are moderately creamy, spicy, and thick. The use of nuts and other dry fruits are common. Dairy products like yogurt, milk, ghee, cottage cheese, and cream play a constituent role in the cooking style of both sweet and savory cuisines. The region also produces a dazzling amount of vegetarian foods, thanks to a large variety of vegetables and fruits which are available throughout the year. North India is home to many different types of rotis (bread), but the most famous of these include tandoori naan, a bread prepared in a clay oven, and stuffed paratha, a flatbread commonly stuffed with vegetarian fillings. Mouthwatering Kulchas are also popular here; they are bread prepared from the fermented dough. Like South Indian culture, Rice is also renowned here but takes a more masala heavy-form in dishes like pulao and biryani. Essential ingredients and spices: aniseed/fennel, garam masala, cloves, cinnamon, cardamom, chili powder, turmeric, dry red chilies, coriander, and cumin. East India is known for its mountains and beaches. The states of East India include Tripura and Orissa, Mizoram, Nagaland, Manipur, Meghalaya, Arunachal Pradesh, Assam, Sikkim, and West Bengal. The favorable climate allows the region to grow a lot of fruit, vegetables, and rice. Vegetarian and non-vegetarians both feel at home in East India. Mongolian and Chinese cuisines have a strong influence in East India due to its proximity and history with the countries. Three different schools of food rule East India - Orissa, Assam, and Bengali. Simplicity is common among all three. Preparations of the food are not elaborate, and people have a minimalist approach to ingredients. Frying and steaming are the prominent methods of cooking. Coastal areas take serious pride in their fish. Sweets reign supreme in East India. Favorites include Sandesh, prepared from sugar and paneer, Rasgulla, made with dumplings in syrup, and Kheer, creamy rice pudding. Essential ingredients and spices: mustard oil, yogurt, gram flour, maize, chilies (both red and green), and panch phoran (consist of five species: seeds of fenugreek, fennel, mustard, onion, and cumin). States that encompass West India include Goa, Maharashtra, Gujarat, and Rajasthan. The states of Gujarat and Rajasthan have relatively drier climates that produce fewer vegetables. Culturally, West India is vegetarian. Coconut and peanuts are predominant ingredients, and they are widely available. Goa has a lush green coastline that offers a variety of fresh seafood. Dishes like Xacuti and Vindaloo pay homage to the fact that until the 1960s, West India was a Portuguese colony. We find an eclectic variety of dishes in West India. Rajasthani cuisine consists mostly of vegetables and usually has a spicy kick. Meats also have a home in Rajasthan -- Laal Maas, which is a red meat curry, is popular across the state. Gujarat, on the other hand, is known for its sweet tooth. Many dishes add at least a pinch of sugar in Gujarat. Thaalis are a hallmark of Gujarati culture. These infamous giant plates contain various dishes including chapati, rice, sweets, and more. The coastal areas like Maharashtra are popular for Malvani food, a coconut based sour curry that is usually eaten with seafood. In Rajasthan and Gujarat: lentils, corn, dry red chilies, gram flour, yogurt, buttermilk, nuts, and sugar. In Maharashtra: rice, fish, peanuts, coconut, Goa fish and rice. Essential ingredients and spices: fish, vinegar, nuts, coconut, sesame seeds, sugar, and dry red chilies. We hope you enjoyed our dive into the different regions of India. Get social with us! Let us know which region is your favorite. India is synonymous with Diwali. The energy in the air is impalpable. However, Diwali’s wings spread way beyond its roots in India. Diwali celebrations are known across the world amongst many large and small countries and communities. Today, we will explore these areas and their unique Indian heritage. 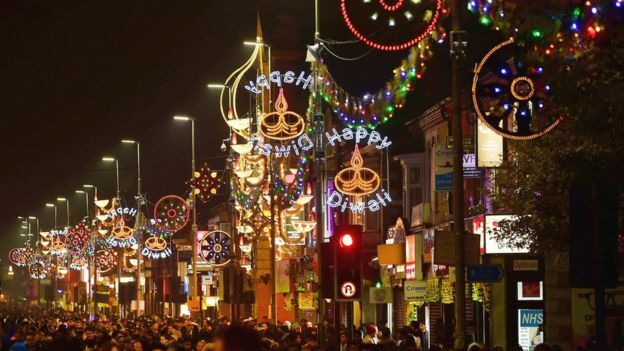 Leicester holds the silver medal for the biggest Diwali celebration around the world. Leicester is a mid-sized city in England’s East Midlands with a population a little above 300,000. Indians have made a home in this diverse city. A little above a quarter of the population is of Indian origin while the most spoken languages after English are Gujarati and Punjabi. Leicester is also home to the “Golden Mile”, a stretch of road that is the city’s Little India. Up to 40,000 people attend the switch-on of the lights at the Golden Mile to mark the beginning of the Diwali festival. The festival lasts for around two weeks and has become a cornerstone for Europe’s Diwali celebrations. The city takes pride in their Diwali festival and has even flown Rangoli artists all the way from India. Guyana is a country on South America’s northern coast and holds a population of around 8 million. 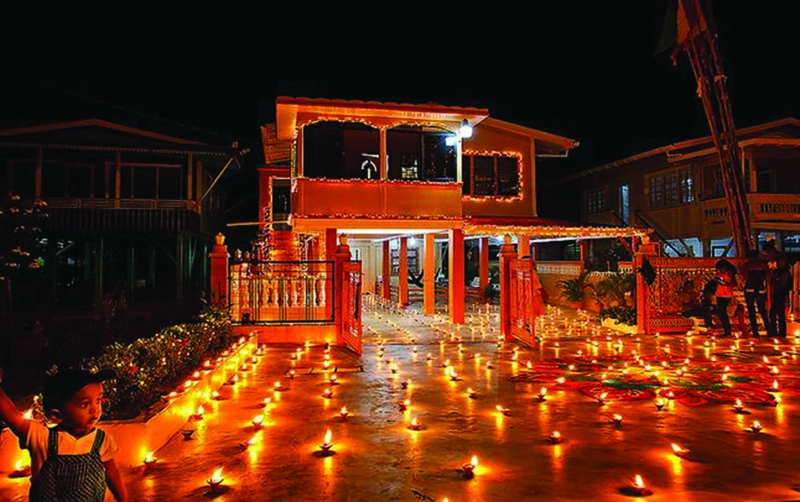 Diwali is a national holiday in Guyana and has been celebrated since 1853. Guyana is known for its energetic displays during the festival of Diwali. Beyond the traditional Diwali celebrations, the people of Guyana holds celebratory motorcades in several cities. The people deck out their vehicles with lights and decorations and drive the cities in long parades attended by thousands. The Indians of Guyana have a very interesting backstory as they were initially recruited as indentured servants and faced harsh conditions upon their arrivals. As of the 2012 census, Indians make up 40% of Guyana’s population. Today, Indians celebrate “Indian Arrival Day” on May 5th to commemorate the first Indians who arrived in Guyana to work on sugar plantations. Triolet is a village of approximately 24,000 people located in the northern part of Mauritius, an Indian Ocean island nation that is known for its beautiful landscapes and geographic diversity. The village of Triolet transforms during Diwali and a small little village shines a beacon of light that is becoming increasingly visible through the world. Mauritius’s population is around 60% of Indian-heritage of which 80% follow Hinduism. Most Mauritian Indians are from the Bihar / Northern India area. Mauritius also celebrates Indian Arrival Day. It is celebrated on November 2nd to commemorate the arrival of Indian laborers. Diwali was originally contained to the local villages and Hindi households in Trinidad and Tobago. It was not as ubiquitously celebrated as the other major religious holidays such as Christmas until a few passionate individuals decided to form a council to spread the message of Diwali. Divali Nagar (City of Lights) was born. 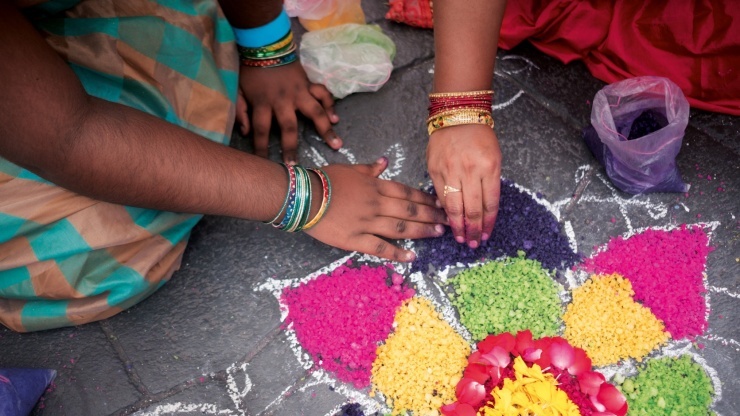 This Caribbean flavored Diwali celebration is now an occasion to unify a nation that consists of Hindus, Muslims, Christians, Indo-Trinidadians, and Afro-Trinidadians. The festival day is regarded as a national holiday. Trinidad and Tobago’s Indians arrived as indentured servants in 1845 and now comprise 37% of the country’s population. They celebrate Indian Arrival Day on November 2nd. During Deepavali, Hindus across the city decorate their homes with brightly colored pictures created out of flour, rice and flower petals. Rangoli artworks shade the city as people of various religions and ethnicities come together to attend the cultural events during this festive period. The cities of Melbourne and Sydney are the focal points for Indian-Australians. Pockets of Indians are spread across these two cities. The Federation Square in Melbourne takes center-stage during Diwali where the largest of the Australian celebrations of Diwali take place. 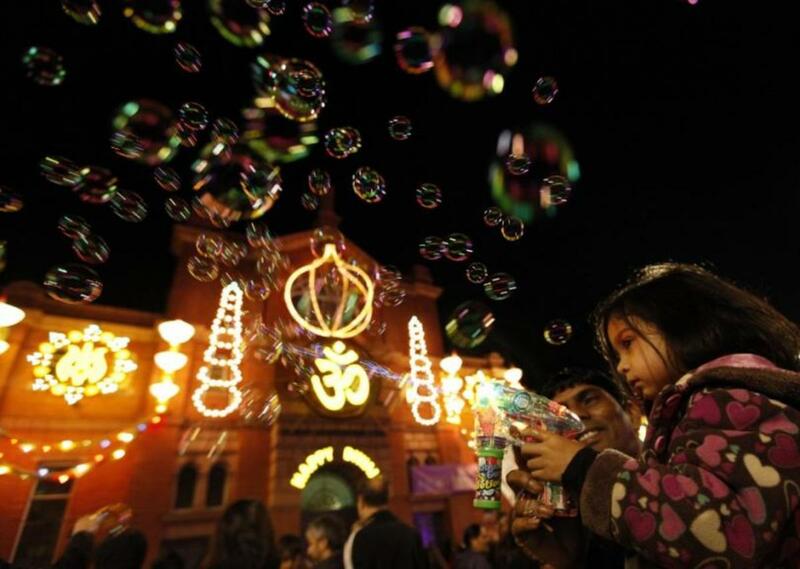 Diwali is not an official government holiday in Australia but it is slowly making its presence felt as the Indian population grows in Australia. Currently, Indians only comprise 72% of Australia’s population, but are the fastest rising minority group in Australia. Is there a country we didn't recognize? Let us know in the comments or on our Facebook page! Rejoice! Summer is approaching! In India, summers can be tough. Our summers may not be as hot as it is in India, but if you're living in Houston, Dallas or Atlanta it may soar up to 100 degrees Fahrenheit (37.7 Celsius). Different seasons call for different foods, but summer is one of our favorites. Refreshment -- the feeling we describe when anything cold provides a pleasant jolt of energy throughout our bodies. In celebration of summer, here is a list of our favorite summer beverages, snacks, and dishes! Mangoes are already known as the king of fruits, but Alphonso takes it one step further and is hailed as the king of the kings. An authentic cold sweet Alphonso mango on a fresh summer day will help you grasp why this champ has held the title for so long. Mango, pista, or malai? It is hard to choose one. Kulfi is a denser, creamier, and more popsicle-like version of ice cream. Kulfi is the quintessential South Asian summer treat because it makes for a satisfying post-meal desert. There are many types of Lassi, but sweet Lassi has a special place in our hearts. Sweet Lassi is a yogurt-based drink that is synonymous with the scorching summer heat. It is a special delight for those who are lactose intolerant as yogurt has relatively low levels of lactose compared to milk. There is a lassi for everyone! Popular types include mango lassi, sweet lassi, sour lassi (the original), and even bhang lassi. Not all summer food has to be sweet. Gourd is a great healthy alternative with an impressive nutrient profile for those who try to avoid refined sugar. Gourd is an acquired taste, but the health benefits of acquiring it are sweet. It is commonly touted for its medicinal benefits. Sugarcane Juice is made from pressed sugarcane. It is popular throughout South Asia and is commonly used to beat the heat. It contains about 15% natural sugar and is full of other nutrients such as organic salts and vitamins. Fans of sugarcane juice routinely point to the energy boost it provides and tout its high concentration calcium, magnesium, potassium, iron, and manganese. Did you know that July is National Watermelon Month? That’s how closely this fruit is tied together with Summer. 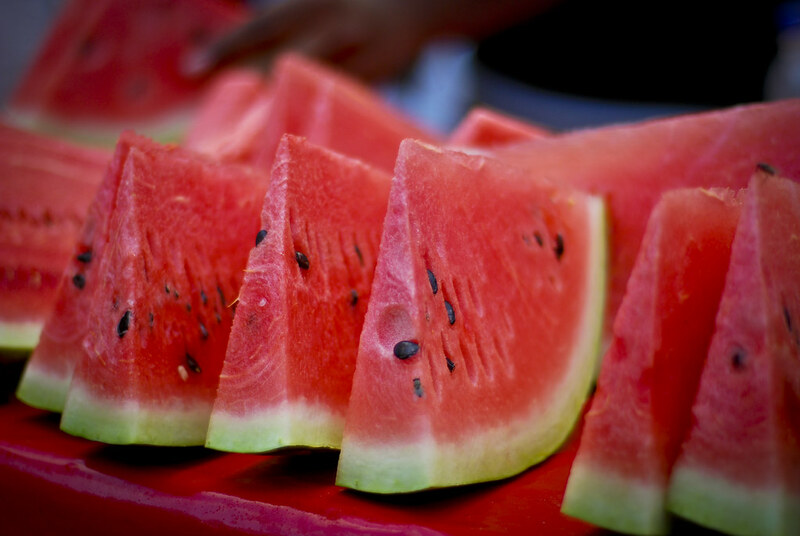 Watermelons are around 91 percent water (fun fact: water is 100 percent water) and can be classified as fruits AND vegetables! Watermelon’s claim to health fame comes from its richness in lycopene, which many claim is a powerful antioxidant. Coconut Water may be an emerging health craze in the United States, but it is an old-school staple in South Asia. It is abundant in many tropical countries and is sold by street vendors who use a machete style knife to cut them open in front of customers. Coconut water also has potassium and electrolytes which make it a great natural rehydrating alternative over commercialized sports drinks. Like this blog post? Let us know. We'll be releasing video recipes through the summer so let us know what you want to see Patel brothers make in the comments! For South Asians, entertainment flows through our blood. So it is no surprise that we have left our mark on digital media. Many young South Asians are making a name for themselves on the internet and have become full on sensations. We made an awesome list of our favorites! Lilly Singh, also known as “IISuperwomanII,” is one of the most popular YouTubers in the game with over 11 million subscribers. She proves that even internet sensations can become household names. She is in the Top 100 YouTube Most Subscribed list and ranked 3rd in Forbes 2016 list of highest paid YouTube stars. Singh has touched the funny bone of audiences worldwide and has collaborated with celebrities like Priyanka Chopra, The Rock, and Selena Gomez. Lily Singh has officially crossed over from internet sensation to a legit media personality. Check out her collab with Priyanka Chopra, it’s one of our favorites! The 21-year-old Canadian born internet star Zaid Ali is known for his viral Facebook and YouTube videos. His multilingual talents gives him the ability to resonate with English, Hindi/Urdu, and even Punjabi audiences with equal warmth. Zaid Ali has also built a large following in Pakistan, where he was recently flown into to host the Hum Style Awards. With over 5 million likes on his Facebook page, young Zaid Ali is proving that being himself is a great look. Deepica Mutyala’s rise to fame began when she released a video on reducing dark circles. Ten million views later she is a regular contributor and beauty expert on the Today Show and has also made appearances on other shows like Dr. Oz. Originally from Texas, Deepica now lives out her dream in New York as a social media personality under the handle @deepicam. Check out her Diwali inspired makeup tutorial! Coke Studio hit for six when they choose Momina to sing alongside Rahet Fateh Ali Khan in a new rendition of Javed Akhtar’s infamous “Afreen Afreen.” Momina ended up being the perfect “Afreen” for the song. Her mixture of eye-catching natural beauty and soothing vocal talent has opened the doors of fame for Momina. On top being of a musician and engineer, she is now also a brand ambassador and philanthropist. Jasmeet Singh, also known as “JusReign,” is one of the funniest Desi comedians out there. His knack for humor goes beyond just skits (which are great too). He knows how to tell a story and how to be plain out goofy. Though he has amassed a mainstream following, his roots are of Sikh Canadian. Singh has used his platform to address serious issues as well. The comedian recently took to twitter to chronicle his experience being profiled by the TSA for wearing a turban. Check out his take on old-fashioned local Indian Grocery stores. Sabrina Siddiqui is a Washington-based political reporter for Guardian news who has worked her way to prominence in the news industry. She covered the recent presidential election where she broke out with her opinion piece that chronicled her experiences as a Muslim reporter. Siddiqui has advocated for Journalism as a career choice for South Asians and hopes to influence young South Asians in following their political passions and dreams. Holidays, Holidays, Holidays! A few tips to make this week easier. It is that time of the year. In many places snow is on the ground and Christmas lights and decorations are up. Many of us are doing last minute shopping and finalizing our plans for the holidays. The children are on winter break and you cannot remember if that is a good thing or not. The holidays give us many things to look forward to from great food, comical moments with family and friends, a little break from our busy lives, presents, among many other things. If you're feeling overwhelmed, remember, a week after Christmas Day you can unwind and celebrate the New Year! Now here are a few tips that can help you enjoy the holidays with a little more ease! 2. Have a plan, but leave some flexibility – No matter what you do or plan, there can always be a setback or delay. It happens, and usually it happens at the worst possible times. From flight delays to traffic, there are many things that can occur. It is difficult to manage large groups of people, especially at a busy time like this. It’s also important that you are mindful of the weather. So be flexible, plan ahead, and understand that stressing yourself out does not accomplish anything. 3. Keep the weather in mind -- The snow is pretty but the winter is tough. The only thing worse than the cold is being stranded in the cold. Make sure your car is in order. Good snow tires are key in the struggle for traction when driving in the snow. Make sure your car is equipped with the essentials like a portable phone charger, jumper cables, salt, and even a blanket. 4. Don’t put it all on yourself – holiday season is about celebrating with family and friends. Don’t be afraid to ask them for help! If you are hosting, you should not be doing everything alone. Delegate some duties to other family members. It helps take a task off your shoulders, while involving others. Also if you are a guest, ask your hosts if they need help. A little courtesy goes a long way! 5. Lastly, have a good time – it is the holidays and you should be cheering and smiling. Many people take this time of the year for granted. Remember not everyone will be home for the holidays or get the time off to celebrate. Enjoy being with your family and friends and share those stories and create some great memories! Be safe, we wish you all the best! Indian snacks are amazing. Whether you’re savoring a crispy samosa or moist gulab jamun, it’s hard to go wrong with Indian snacks. Snacking is a huge part of Indian culture, but it can be confusing where to start. By the end of this article, you’ll know how to snack like an Indian. When I was younger I sprained my ankle playing basketball. Ankle sprains are common in basketball, but that doesn't mean they won’t have you yelling for mommy. My parents were ready with a treatment on hand, Haldi (Turmeric). They claimed it was a herbal medicine that would "absorb the pain". I was immediately skeptical -- but my parents insisted I try it. I followed the R.I.C.E. (Rest, Ice, Compress, and Elevate) protocol but added an extra step where I rubbed Turmeric all over my ankle before wrapping it. They failed to mention the vibrant stain it leaves behind. I still remember the puzzled look on my friends faces when I showed up to school limping on a bright yellow ankle. Recently, I sprained my knee. After limping for days, I gave into the same treatment, a Turmeric wrap. I felt great the next day, it was as if the pain was sucked away. Now, I know what you're thinking (and I'm with you), it's most likely a coincidence. But it made me curious, how did this plant develop its massive reputation? In the age of social media, where continuous sharing and connectedness are normal parts of everyday life, it’s no surprise that Holi, a colorful holiday that preaches inclusion, revitalization, and oneness, has risen in popularity. A search for #holi2012 on Instagram populates around 251 results, while a search for #holi2015 returns over 20,000! The throwing of colored powder into the air is what comes to mind when most people think of Holi. As the legend goes, the eclectic Lord Krishna griped to his mother about how a woman, Radha, had a fair complexion while his was dark. She suggested he throw color on Radha’s face and remove the difference between them. This is why people play with color and water during Holi, the splashes of color symbolize the breakdown of barriers of color, creed, and religion. Holi celebrations have transformed into must attend cultural events. The Sri Radha Krishna Temple in Spanish Fork, Utah (approximately 50 miles South of Salt Lake City) recently held a 70,000 person multi-day Holi Festival where non Hindu attendees outnumbered Hindus 2 to 1. College campuses have also played a big part of Holi coming to the mainstream. During Holi, students at many campuses can be seen participating in Holi-inspired color throws. The Soul of India is on full display during Holi. A vibrant energy which Indians believe represents their culture is felt in the air. The inclusive nature of the celebrations is on full display when crowds of strangers wearing all white t-shirts throw fistfuls of organic powder into the air and each other. At a time when the media portrays a divisive world, Holi serves a reminder that inclusion is the norm. The celebration of Holy by non-Hindus is the ultimate affirmation that some traditions are timeless.